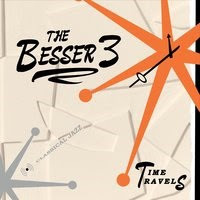 The Besser 3 are a jazz band originating from New Zealand and their latest offering intrigued your reviewer for two reasons: firstly, because New Zealand jazz is very rarely heard in the United Kingdom and, secondly, the record is described as classical jazz rather than simply jazz. The band was formed by John Besser (a New York City native) who has lived in New Zealand most of his life. He was a founding member of the electronic group Free Radicals and has spent much of his career composing film scores in collaboration with leading writers, choreographers, musicians, artists and film makers. The album Time Travels runs to 11 tracks with titles like Who's Counting and Three Monks. The question is whether this should really be classed as "classical jazz". To me, this is a jazz album with some hidden twists. Not outstanding in my opinion, but the music is very good and an enjoyable listen. Throughout the album, John’s piano and Daniel Christopher’s electric bass dominate with either driving the rhythm, although in Three Monks Electric the guitar is brought to the fore. At times, it is very cinematic and, in tracks like Klezmatized, it has an added folky 1920s feel. Having said that, it is not always about looking back to the history of jazz. Three Monks, for example, is very funky while One Two Three is straight out of the circus. Overall, The Besser 3’s great swing ability adds interest to this release. As already stated, this album ticks all the right boxes musically but it is not a classic. In order to stand out in jazz today, there has to be a unique element which is sadly lacking here. The songs show a sense of fun and are played to a very high standard but they are not memorable. Overall, I believe people will enjoy this album, but it may not have longevity. I do, however, suspect The Besser 3 is a band to look out for with really great things to come.